When people think about the future of North Dakota basketball (which, I know the majority of people DO lay in bed at night thinking about the future of North Dakota basketball), the first thing that comes to mind is their five-member class of 2014, and for good reason. As a class, they had a very successful freshman year, and they provide a lot of hope for the future, particularly when North Dakota enters the Big Sky next season and is eligible for the NCAA Tournament. For next season, however, their best player is probably Patrick Mitchell, who will be a senior. 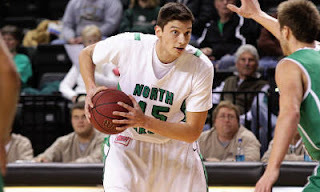 The 6'8'' F averaged 10.6 PPG and 5.8 RPG last season for the 17-16 Sioux. Mitchell is a solid all-around player... he doesn't dominate in any area, but he does a little bit of everything. Probably his best attribute is his versatility on offense. He shot 37% from downtown (on 140 attempts), but he also shot a solid 49.6% from 2s, and got to the line a solid 105 times. His 52.7 EFG% was second on the team behind only Brandon Brekke. He also had the highest DR Rate on the team, at 19.6%, which was about 200th in the nation. For a team that does not have a lot of height (or, frankly speaking, talent) down low, this is huge for UND. Mitchell can also make some opponents think twice in the lane, as he had a 6.8% Block Rate, 92nd in the nation. He could stand to improve his FT shooting a bit, as he shot only 63.8%, and any improvement would make a difference since he is adept at getting to the line. ... it’s important to note that while Huff is the most talented player on the team, Mitchell is probably its best player. I think this is true he played the best and looking forward to another season where I will enjoy watching him cause he is a team player!